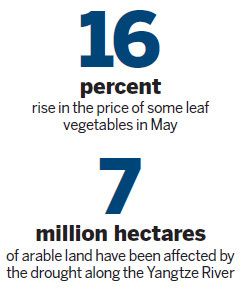 SHANGHAI - The impacts of China's worst drought in 50 years have been served up on the nation's dining tables as the price of rice and vegetables from drought-hit provinces have skyrocketed. The average price of staple foods in 50 cities has increased significantly, and the price of some leaf vegetables has jumped 16 percent in one month, according to data from the National Bureau of Statistics. "I didn't buy many leaf vegetables in the last week because the price is getting crazy," said Zhang Weirong, a 67-year-old Shanghai resident. "Cabbage used to be as cheap as paper, and for 5 yuan (77 cents) you would get too many cabbages to carry home," she said. "My grandson said he doesn't like the dishes I cook these days, but what else can I do?" she said. Shoppers at a supermarket in Shanghai's Huangpu district complained that the price of rice produced in Hubei increased 20 percent in one month to 2.6 yuan a kg. Lotus root produced in Hunan also climbed 20 percent during the same period to 4.2 yuan a kg. If food prices continue to soar during the summer, the increase may exceed 20 percent, which will push up inflation in the short term, Liu Ligang, an economist for the Greater China area with the ANZ Bank, said in his column for Financial Times. 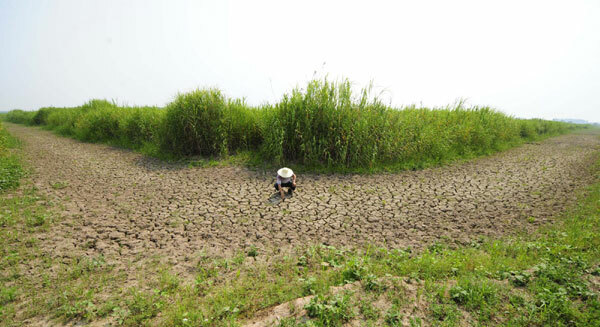 On another note, Gao Wenqi, a researcher with the Shanghai Agricultural Technology Extension and Service Center, said the drought has provided better conditions for aphids to reproduce. Aphids can produce a new generation in days with no rain, said Gao.